An incentive is something that motivates employees to achieve the company's goals while serving their own interests. It is important that all the company's employees understood that they can achieve their goals only if the company's goals are achieved. Many companies resort to complex performance evaluations using various tools. ELMA offers the Performance Matrix tool, which includes various evaluation criteria. Each criterion in the matrix has weight, which affects the overall performance of the employee. 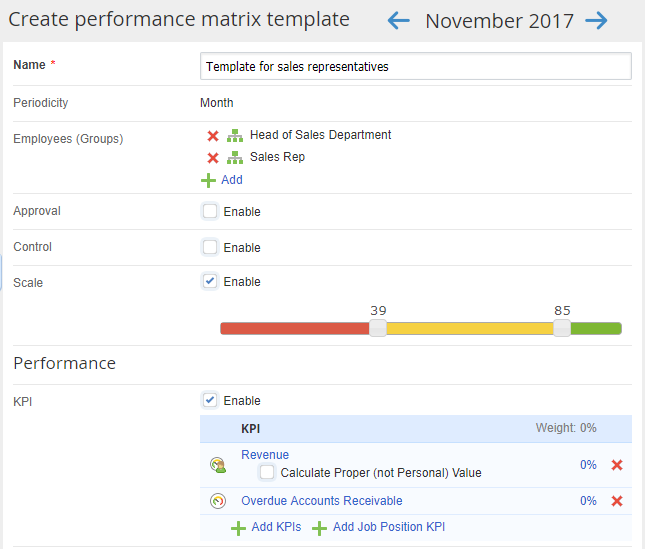 Performance Matrix is a set of KPIs, SMART tasks, expert assessments and time reports, used to evaluate the performance of an employee over a certain period (month, quarter, year). 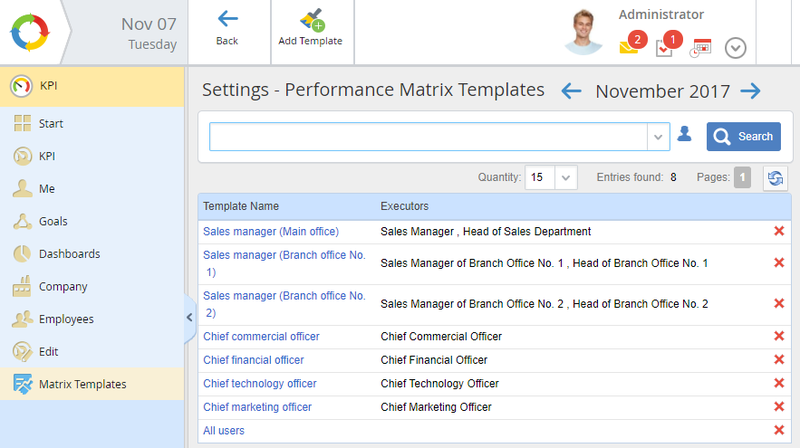 A performance matrix is created in Web Application for each employee, using a Template. 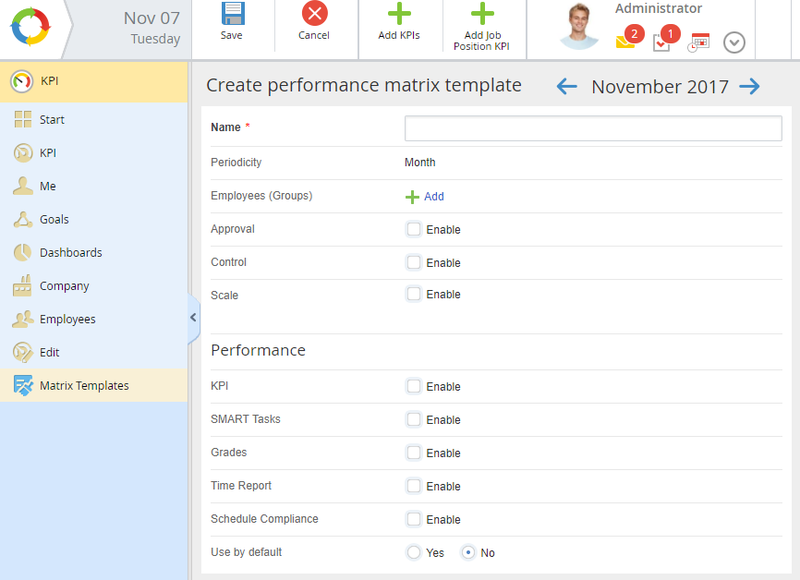 Performance matrix template is a structured set of performance matrix components for a certain job position. Consider an example of setting goals and evaluating the performance of a sales rep. 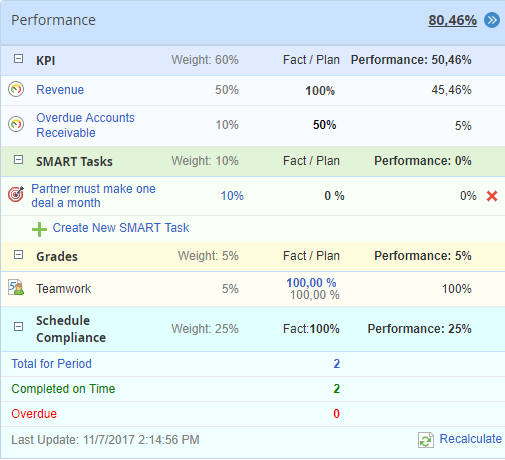 In this example, the employee is evaluated by the Revenue and Overdue Accounts Receivable KPIs, SMART task Partner must make one deal a month, Teamwork manager's assessment and schedule compliance. All these criteria have base, standard and target values. At the end of the month, the employee's performance is calculated based on their results. 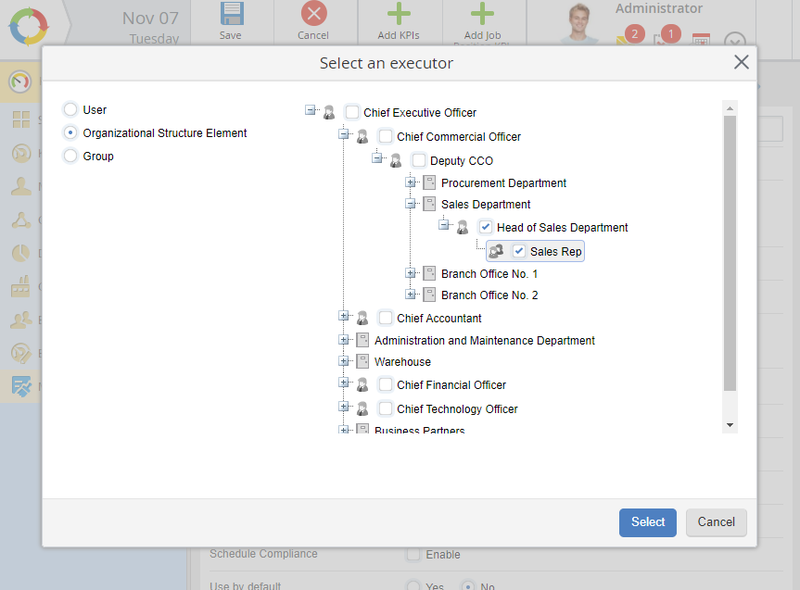 The template is configured for each job position individually. To learn more about creating templates, see Help. 1. Name: Template for sales representatives. The scale size is 100%. By moving sliders along the scale you can set the status borders: in this example, the status will be red under 39%, yellow from 40 to 85% and green above 85%. 5. Add KPIs to the matrix. Select the KPIs of the job position or user, which will be used to evaluate the employee's performance in the upcoming month. The set of KPIs depends on the current situation and objectives of the company (department). Some KPIs may be permanent for this job position, but in general, the set of KPIs may change. It is important that the set of KPIs is balanced. A matrix can include simple/personal KPIs and metrics. To be able to add KPIs to the matrix, they must be already created in ELMA Designer. To learn more about creating KPIs, read this Help section. If a performance matrix comprises only KPIs, then the total of all the KPI weight must be 100%. If a matrix includes other criteria, such as SMART tasks, assessments, and schedule compliance, then the total of weight of all criteria must be 100%. Enable SMART tasks. 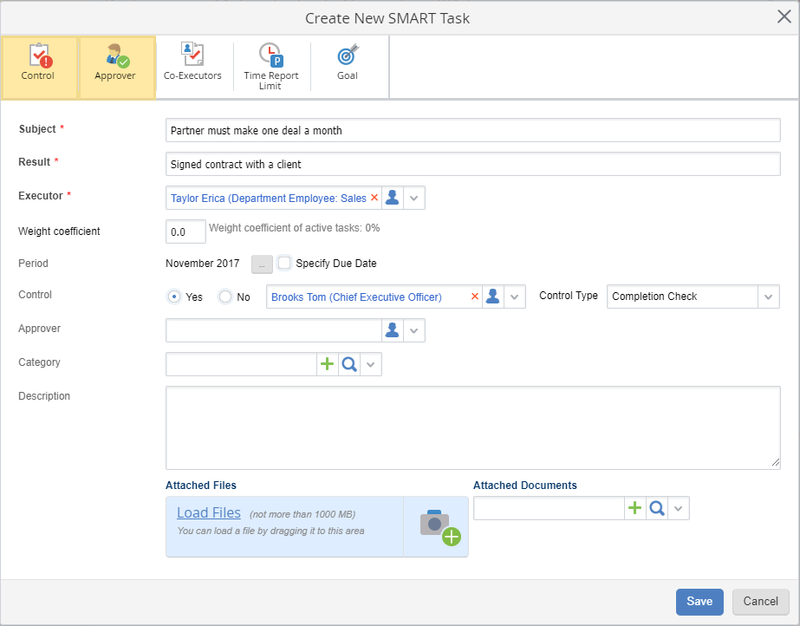 Users can assign SMART tasks to each other and to themselves in the performance matrix so that it always reflected the goals they've set for the month. To learn more about SMART tasks, see Help. SMART tasks are not created in the template, but you can set their weight. 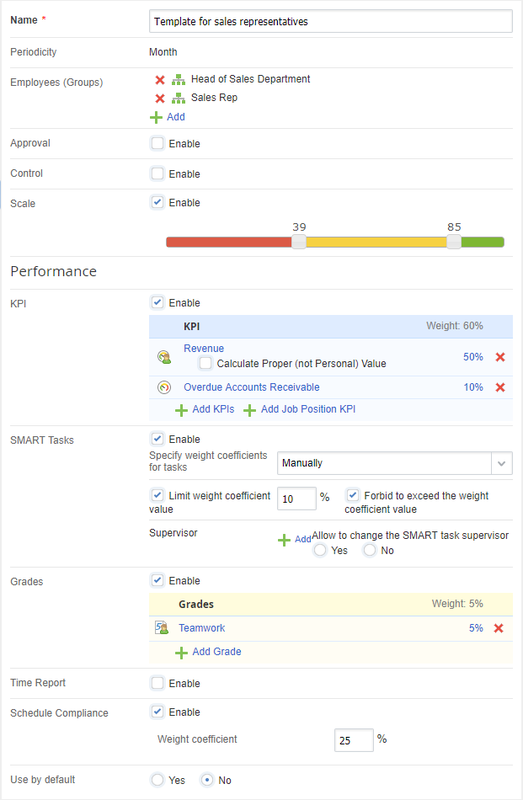 Often performance cannot be evaluated by KPIs and SMART tasks. 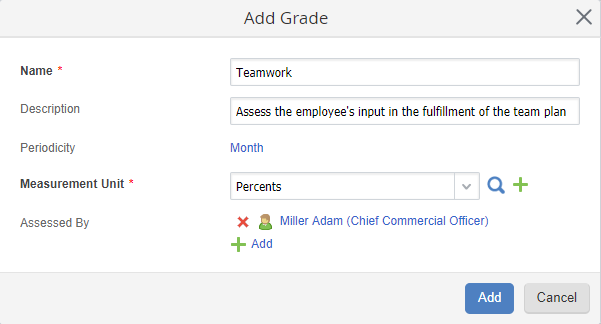 In this case, you can use grades - assessments made by managers. In this case, a grade can be assigned for the current month as well, but the task will be assigned at the beginning of the next month anyway. the Revenue KPI, which was fulfilled by 100% out of 110% - the performance is 45.46%. the SMART task is not completed yet, so the performance is 0%. the manager's assessment is 100%, the performance is 5%. Schedule compliance is also 100%: two tasks were assigned and both were completed in time. The performance is 25%. Result: if the accounts receivable are reduced by another 50%, partners make deals faster, and the revenue will raise to the planned value, then the employee's performance will be 100%. The head of the department and the employee can see what to work on until the end of the month to achieve 100% performance.